Before you head out this spring, be sure to check on the condition of your vehicle and your tires. Tires should have plenty of tread depth to evacuate standing water from between the road surface and your tire. If your current tires are worn down to anywhere near the wear bars (2.5mm or 3.0mm), it’s time to think about replacing your tires. Tire pressure that is too low or too high can lead to reduced traction, premature tread wear, or tire damage. Check your tire pressure regularly (at least once a month) to make sure they’re properly inflated. Keep a further distance from the car in front of you since braking distances are longer on wet roads. Staying back also keeps you away from the tire spray of the vehicle in front, giving you better visibility. 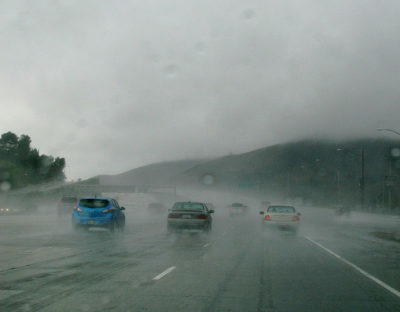 If the rain becomes too heavy and you are uncomfortable with your visibility, stop driving. Heavy rain can overload your wiper blades, causing a constant sheet of water to flow over the screen, making visibility close to zero.